Whether you attended RollerCon this year or not, and whether or not you’ll ever attend in the future, my big takeaways are things you can start working on NOW to make some big improvements to your game. As a long-time coach with a first-timer presence in the vendor village, I found myself busy daily from 8:30am until 7pm or later, with no chance to return to my room, no breaks, no chill-out times. I don’t think I saw the first bite of dinner before 9:30pm all week, and I most definitely never saw the Uterus Pool in daylight. That was the intense part. But at the same time, I got to reconnect with old friends, meet athletes whom I’ve trained but only known over email and Facebook, and meet tons of new skaters for the first time in my classes and my booth. I always learn so much from all the conversations that happen at RollerCon, whether through a question that comes up in a class I’m coaching, informally over a margarita in the evening, or in the coffee line-up. That’s the invigorating part. And the surprising stuff? 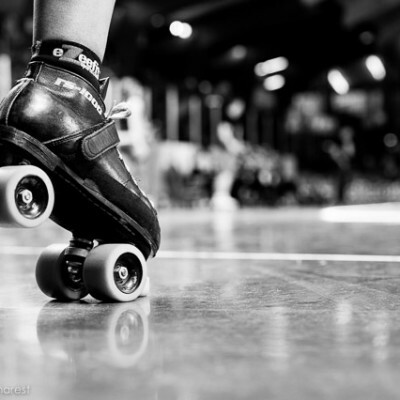 There’s always something new to learn at RollerCon, no matter how many years you’ve attended. Here are my top three insights from RollerCon 2017. The $8 breakfast burrito at the Fortuna coffee bar in the Westgate lobby is the best deal in the entire joint. You can share it with your roomie, or eat half while you’re lined up for your first class, and the other half after. Why have I never discovered this wonderful option before? Why didn’t you guys tell me this was a thing?! (OK, this isn’t something that you can work on if you’re not coming to RollerCon next year. But it still blew my mind). As a group, our struggle with self-confidence may be the single largest challenge we face. The self-effacing, self-apologizing, and widespread lack of self-confidence I observed was so prevalent that I would describe it as a crisis. Skaters who don’t think they’re worthy of talking to another skater who they deem as being a ‘celebrity.’ Skaters who underestimate their skill level for classes and challenge bouts. Skaters who don’t feel worthy of leading their teams as captains. Skaters who apologize for their questions. Skaters who apologize or feel terrible for not nailing a new skill on the first try. I observed this crisis of confidence in every corner, and it’s something I want to work on more with Roller Derby Athletics in the coming year. RDA Coach Jess Bandit led a Confidence Challenge in June of this year; knowing how valuable it was to the participants, and how widespread the issue is in our community, we will definitely be running similar programs again in the near future. Just like your physical skills, mental skills require practice and repetition. So in the meantime, I suggest you try the ‘fake it ‘til you make it’ approach and practice being your most confident self for at least a few minutes a day. 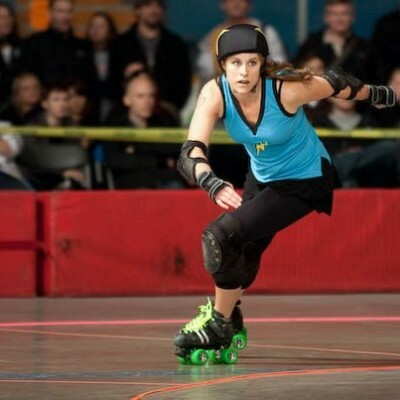 If RollerCon attendees are a representative bunch of the entire derby community, then MORE THAN FIFTY PERCENT of you are not using good form to squat or jump. Of course I always notice these tendencies when I coach teams and leagues in person, or when I coach at RollerCon, and do my best to offer explanations and corrections. But this year for the first time I tried to observe the relative numbers of folks who needed to modify their form. It was definitely more than half of each group I worked with! Why should this be important to you? Number one, there’s a better than 50% chance I’m talking about you (!!). Number two, if your weight isn’t back in your heels where it belongs, then you’re not using your glutes and hamstrings for power (only using your quads), so you’re basically cutting your force in half. Number three, if your knees are knocking together, you’re putting yourself at risk for knee injuries, hip dysfunction, and eventually back pain. Now would be an excellent time to review this Pre-Hab video on Proper Form… And stay tuned for more squat-related instructional videos coming your way soon – watch this space! If you’re not attending RollerCon any time soon, you might not be able to benefit from my first insight about the burrito – but you can definitely put some work in on your self-confidence, and on your squatting form. PS: Want to get the class notes from all my RollerCon classes? Simply send a blank email to rollercon “at” rollerderbyathletics.com and my robots will send them your way!